Most often, people that work in TV news, need to go out and find the news. But sometimes, the news comes crashing right through your sunroof. 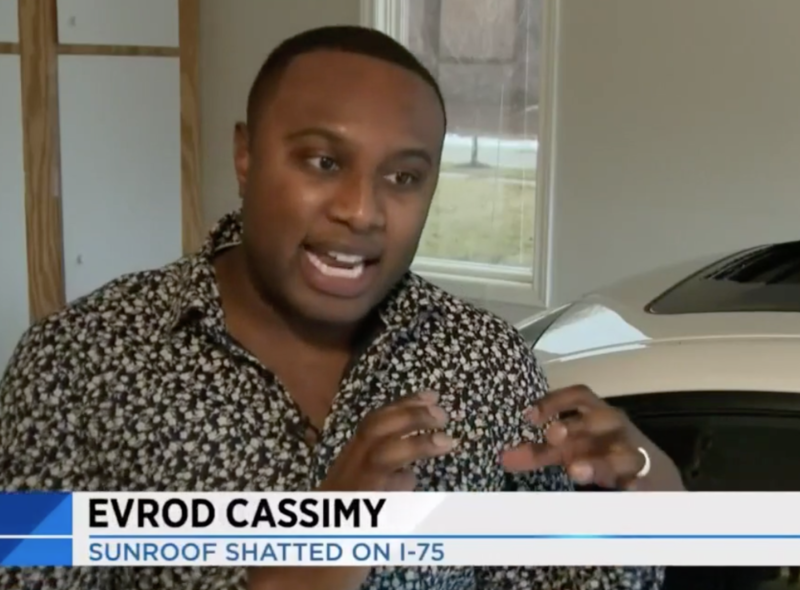 WDIV (Detroit) Anchor Evrod Cassimy was driving home from work when it hit him. “It” was a big chunk of a concrete fell off an overpass that Cassimy was driving under. It landed on his sunroof and smashed it to bits. "Out of nowhere, I just heard a loud, 'Boom!'" he said. "It sounded as if I had either hit the wall or another car, but I didn't feel the impact." Glass shattered everywhere in his car and Cassimy was shaken by the incident, but he is OK. He said he immediately thought about his children when he looked in the back seat and saw their car seats covered in glass. "The odd thing is...in our line of work, we hear about this all the time, and every single time I have heard about it, I was like, 'That is going to happen to me,'" Cassimy said. The Michigan Department of Transportation is working to patch different areas of I-75, but drivers are warned that a change in temperatures has led to crumbling roads.